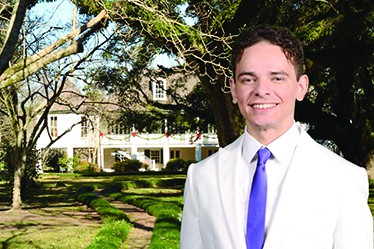 My name is Nick Wright and I am pleased and honored to announce my candidacy for Natchitoches Parish President. Having spent my childhood between Natchitoches and Branson, I am familiar with tourism as well as road construction. My father was a concrete layer supervisor. Now, more than ever, Natchitoches Parish needs ethical leadership. I am all in. I have leadership experience in the military and administrative experience through my education. During the next 4-year term, Natchitoches Parish will deal with many important issues including paving the roads and parish economic development. In addition, the conducting of an audit, locality development, and cost-cutting management procedures will be my passion. In addition, we have a fiscal crisis building up in the Road Maintenance Fund. I will work with the Parish Council to forge a direction of rational growth. I believe committedly that the good times will roll. Also, I think it is time for a communal long-term parish charrette to generate visions of the future from the citizens’ collective wisdom. As I close, I believe that Natchitoches Parish is at the dawning of an incredible boom. Once elected, I will work with the Parish Council to adjust millage rates to reflect demographic changes.